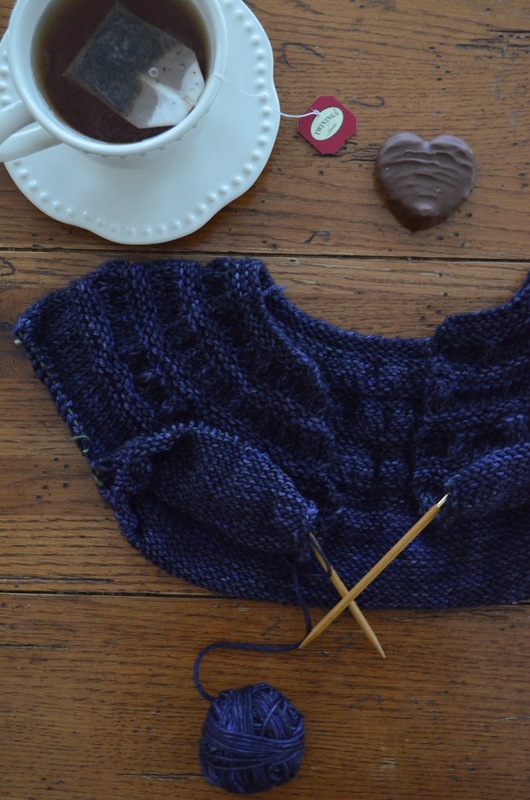 I am so happy that I am knitting my first sweater. It has been a little nerve-wracking (just ask my sister who had to talk me off of a cliff as I was working on the armholes with her on the phone!). Also, I dropped a stitch and didn't realize it for a few rows last night. Normally, I would just put the project into my basket and bring it to Monika for repairs, but this time I decided to actually look up a video on picking up a dropped stitch. Do you know what? It was easy to fix! I am still surprised! My goal is to be ready to knit the sleeves by Thursday's Knit Night (which means that I have about 8 inches of stockinette to crank out). Those will require that I use double pointed needles, so I'll need a little guidance before I begin. I am not reading anything right now. It is sad, but true. The children and I are still in Ramona-Land though! Yay for Tiny Tea Leaves! I just finished knitting it all the way to the button hole rows. You can see mine here. http://wp.me/p2AXV1-uc. I think it's a great beginner sweater! I really do have to try this sweater, it seems to be a good knit for a novice like me! I love seeing all the Tiny Tea Leaves Projects in the Yarn Alongs too! Good for you! I have been thinking a lot about learning to crochet now that we are going to be homeschooling. it will be nice to have something in my hands while I am sitting with the children as they complete some of their work. Your sweater looks lovely. My very favorite part of sweater knitting is dividing for the sleeves, since it finally starts to look like a sweater. I'm knitting my first pair of socks right now, and turning the heel was fun because they started to look like socks! love your tea leaves! It's a fun pattern to knit. Glad you found the dropped stitch in time!! rather easy to do. Keep on keeping on. your tea leaves looks lovely, have fun finishing!